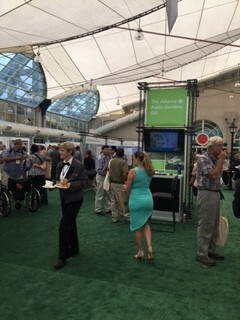 This past week, 3500 people attended the Esri Federal GIS Conference held in Washington, D.C. Attendees came from virtually every federal agency, nongovernmental organizations (NGOs), GIS companies and other agencies that support federal and state agencies. Esri president Jack Dangermond kicked off the plenary with a reminder that the world is rapidly changing and we are confronted with new issues such as loss of biodiversity. GIS helps to build intelligence about these issues. Some user work was showcased such as the first global dataset of biomass – in Woods Hole, and the relationship between hydrology and biofuels. Presenters focused on topics such as integration, collaboration and breaking down government silos.